Off course, my main dish usually holds a large dose of progressive rock or metal, but sometimes you just have to vary your diet, to keep things interesting. Now Instrumental music, either fusion or melodic blues inflated guitar stuff still is my other love. 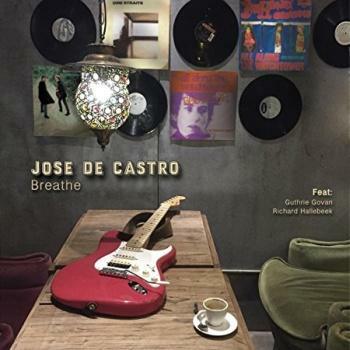 Therefore I was very happy when Breathe, by Spanish guitarist José de Castro was sent to me for a review. I came to know José a number of years ago when he was doing an European clinic tour alongside two other guitarists, promoting the brand of guitar he was playing back then. Coincidence that both those guitarists appear on José de Castro's fifth studio album? I guess not, for the three musicians totally connected and bonded during the final jams, every time I saw them. But what to expect of the album? As a guitarist, José remains close to the blues, in a very melodic style, which is recognizable by his percussive use of his right hand. I would describe his as a combination of Robben Ford, Robin Trower, Stevie Ray Vaughan and Eric Johnson; smooth, creative and very pleasant to listen to. During the album's opener Raw And Dirty, the basics are delicate melodic blues riffs, but José is one of those players that are able to let the guitar speak and his catchy melodies, make up the lack of a vocalist. Come One shows the percussive aspect of José's playing, which I adore. Guest on this track is the Dutch fusion virtuoso Richard Hallebeek. On whose wonderful album RHPII-Pain In The Jazz (2012, see review) José participated. It great to see/hear how both, very different styles are fused during this song. Blues Eyes is a smooth slow blues track, where sometimes the melodies tend remind me a bit of Purple Rain. The more powerful Relax blends elements of the mentioned SRV with his own distinguished style, leaving a stunning impression. Go Away is a nice smooth song to listen to, here José shows how to express your emotion though his guitar. Once in a while, you come across brilliant tracks, well at least brilliant for me; Lenny by Stevie Ray Vaughan, She Knows Me Well by Frank Gambale. Breathe, the title track fits in that category. The only vocal track on the album is Bob Dylan's All Along The Watchtower; probably better know when played by the legendary Jimi Hendrix. José brings is the family to play tambourine and rhythm guitar and the result is quite pleasing, vocally there are some doubts, but his guitar phrasing is impeccable. Smooth Neck and Bridge are both two slow bluesy tracks; late at night, a small glass of your favourite drink and José delicate guitar sounds, who needs more. The second guest on the album; Guthrie Govan (Asia, Steven Wilson, The Aristocrats) appears on the most powerful track on the album; Too Loud, much more technical driven and a perfect symbiosis with de Castro's blues feel. In the end, my favourite composition on the album. The final track also is a cover, this time it's The Sound Of Silence, originally by Simon And Garfunkel, but lately successfully covered by Disturbed. Due to the fact the other instruments apart from the guitar are programmed, this song doesn't completely match the high standard the rest of the songs are, although his guitar playing remains beautiful. Every time I hear José de Castro play, it gives me pleasure, he is recognizable, humble and incredible. If you like wonderful guitar music, with a strong bluesy touch, you should give Breathe a try. Hallebeek and Govan are the very nice icings on this lovely cake.